Departure: 7:45 am start to pick up from Santa Teresa. 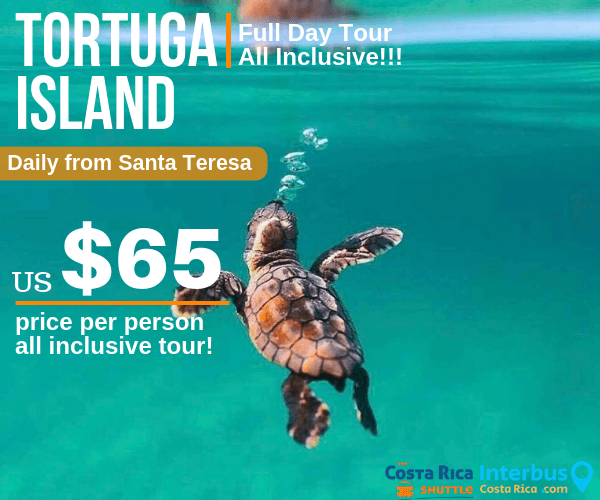 Return: 5:30 pm back to your hotel in Santa Teresa. 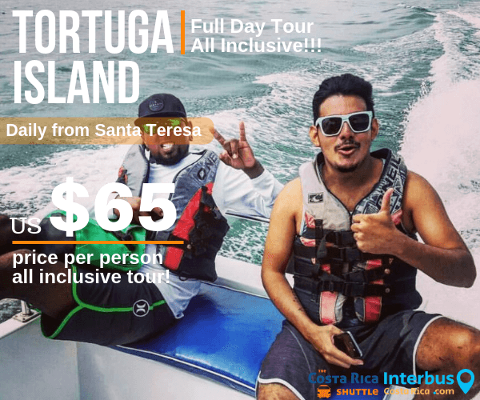 Includes; pop drinks, beers, fresh tropical fruits, full lunch, snorkeling gear and much more. 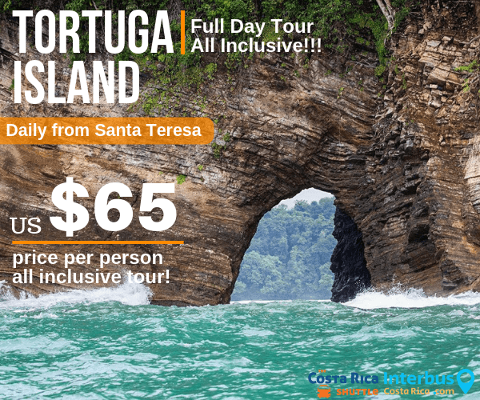 Tortuga Island Costa Rica - Tortuga Island Tour Cruising along the coast for a breathtaking 50-minute boat ride is how you’ll begin your voyage to Tortuga Island. Jagged volcanic rock spills into the sea to create a dramatic contrast with the brown sand, red rocks and crushed shells that make up the variety of different beaches along the way. 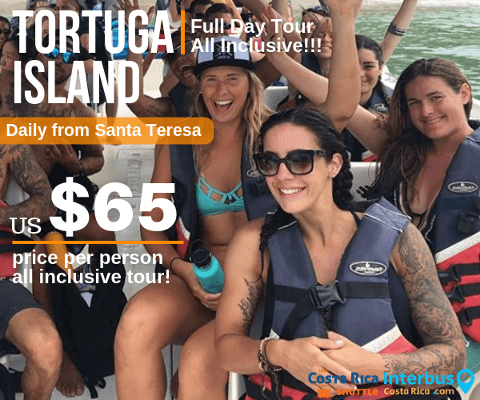 Spotting a group of playful dolphins, marveling at the enormous jumping manta rays or for the luckiest of visitors, catching a glimpse of surfacing humpback whales are just a few examples of the marine life frequently viewed as we make our way to the island. 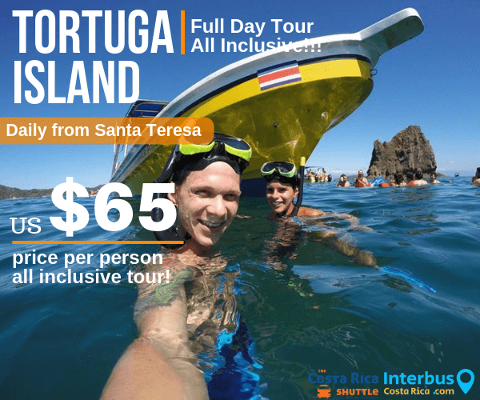 Upon arriving to the tropical paradise of Tortuga Island we anchor the boat within viewing distance of the white sand beach for our first snorkeling session. 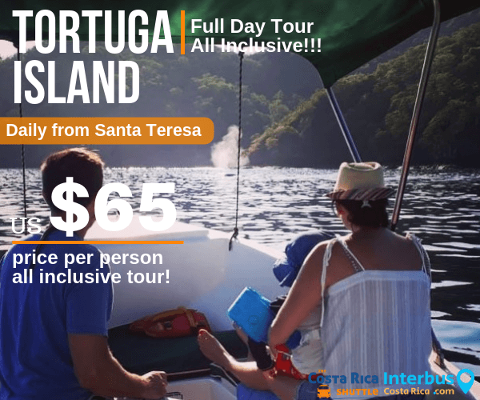 The crystal waters at Tortuga Island are surrounded by volcanic rock reef which is home of the best snorkeling site on Costa Rica’s Central Pacific coast. King Angelfish, Porcupine fish, Morays, Needlefish, Spotted Eagle Rays and a myriad of other tropical beauties make for a phenomenal snorkeling experience. Not to mention the oysters your guide might find for a fresh ceviche on the beach! 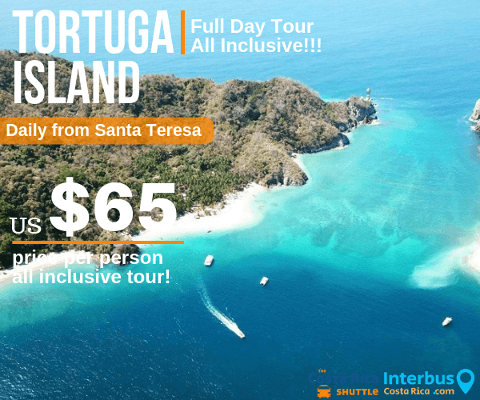 After your incredible snorkeling adventure we take you onto the white sand beach of Tortuga Island. While lunch is being prepared grab a cold drink and take a stroll along the beach and swim in the calm crystal waters. For lunch our chef serves up fresh BBQ fish or chicken in his secret sauce, tasty grilled potatoes and vegetables, bread and a big fresh tropical fruit buffet. Take part in a volleyball game or rent a kayak to discover the other secluded beaches of the island. 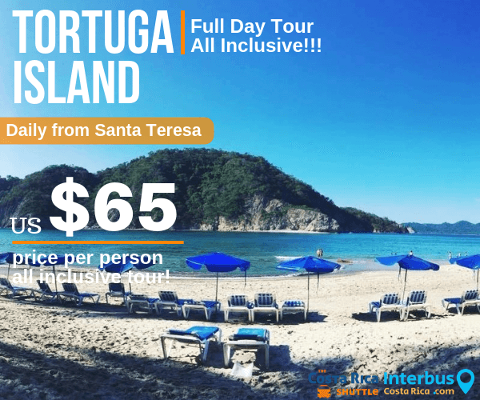 Or for the more adventurous take a hike up to the top of the island for some spectacular views of the Gulf of Nicoya and the surrounding islands. Join us for a second snorkeling session at a different spot on the reef or take a siesta under the coco palms on the island. As the day comes to an end we get back on the boat for the picturesque ride back to Montezuma / Santa Teresa.